Trade 5. Shorted the 50% level as it had confluence with the double top area. One lot of course. To close to my max risk for the day to chance any more lots than that. But I got 30 ticks from it to offset the rest of the day. The previous losers were all multiple lots which explains why -2.5RR +3RR does not equal +.5RR!!! Reason for trade: I was afraid it would be hours before I saw a good set up based on the fact i missed all the actual early set ups. Reason for trade: Counter trend set up. Reasonable risk. All CT trades are single lots. No exceptions. Emotions in trade: Calm. No fear. Just exection. Moved to BE very quickly as I always do in CT situations. I don’t care if they work or not, just execute and let it play out. Emotions in Trade: Impatient. I want it to work right away….Its getting late...seems like things should be moving faster and yet I know perfectly well this is normal behavior. Let it go, breathe deeply and just be patient. The bars where I am not in a trade seem to move fast and purposeful. And the bars where I am in a trade seem to move slowly and random. Its my monkey brain playing tricks on me. I forgot to take a picture. A 100% fail today….here is something I know for certain. After a large move (relatively speaking) there is always some back and forth. I know this and when I see the move overnight, I get frustrated because I know my trading hours might be full of head fakes, chop and counter trend movement. None of which is conducive to productive trading. Such was the case today. I knew it when I sat down in front of the screens that it might be a tough day. After the Syrian spike yesterday evening, it was a long move down as I suspected it might be. I was just hoping it wouldn’t do it all while I was sleeping and it did. I’m very annoyed with myself in not having the patience to sit on my hands while all this was going on. The pressure to put up profit numbers every day intensified yesterday and as I noted in my post last night, that increases the likelihood that losers will occur. Today is the first day where I might have been mostly aware of my emotions and thought processes before, during and after a trade. 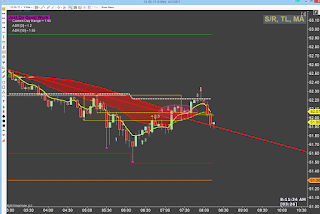 While trade 2, the counter trend trade was the only one that really worked, (trade 1 did work for a while) I executed it correctly. 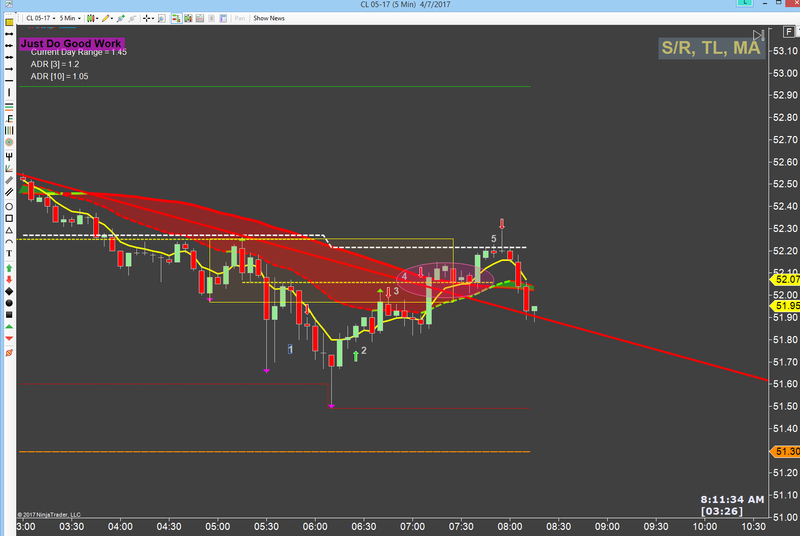 I closed it out at the first sign of it not working which is what you are supposed to do on counter trend trades. I am not deterred however. Monday I will be back at it with steely determination and with any luck, a slightly higher degree of patience. EDIT: It seems like ever time I DON"T trade with a limit order, it would have worked. And every time I DO trade with a limit order, it fails. Anyone else have this experience? EDIT 2: I have to remember even a one lot trade that takes 20 minutes to pay $100 is still $300 an hour. Sheesh....grow a pair and be grateful for the small winners. Even those are better than working for the California minimum wage.